It is a scientifically proven fact that I live under a rock. So even though I'm a huge bookworm, I often don't hear about popular authors until the buzz has almost died down. And even when I do hear about them, I'm rarely inclined to try them out. 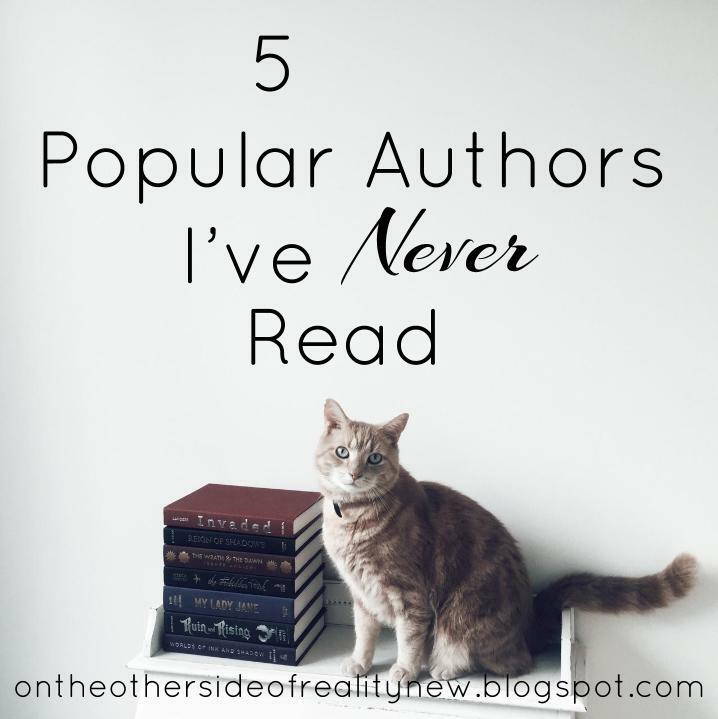 As a result, there's quite a long list of very popular authors I've never read....here are a few. 1. V.E. Schwab. This one makes the least sense, as her books sound EXACTLY like the kind of stuff I'd like. Dark fantasy with lots of magic? That's my jam! I guess the hype scares me away......? 2. Cassandra Clare. This one is mainly because I'd have no idea where to start. From what I can gather, it sounds like there are ten trillion interweaving series with spinoffs and prequels galore except you have to read them in the right order or you will be Majorly Confused. Or maybe I'm just Majorly Confused. It's probably that. 3. Rick Riordan. Like Ms. Clare above, this one confuses the hell out of me. There seem to be about six million books, all taking place in the same universe, with overlapping characters and timelines and gahhhh. Plus, I believe most of his novels are MG, so I don't know if I would still enjoy them. 4. Marissa Meyer. I think this one is because the Lunar Chronicles have never really appealed to me - it's rare I enjoy fantasy retellings, plus sci-fi has never been my thing. Aaaaand I've officially either scared off or offended all of my followers now. Great. CASSADRA CLARE OMGASDFGHJK....I am in love with The Mortal Instruments. It's a beautiful series, and yet I haven't read all of the spinoffs and so I feel like a very bad fangirl right now :/ But the ones I did read I just read starting with TMI and then onwards to TID, etc etc. And I struggle with Rick Riordan. I love his Heroes of Olympus series, but I have to admit that I didn't really enjoy Sea of Monsters. Plus the movies... *shudder*. Do NOT mention those movies to me unless you want to see me hit something. Yeah, City of Bones is the first book in the TMI series. It's also one of the best, in my opinion. My uncle was in my house the other day and saw the PJ movie 'Sea of Monsters', and God knows what possessed him but he started playing it and as soon as I walked into the room I just turned around and walked out again. I despise those movies. I actually haven't read any of these, either! You're not alone, haha! Schwab is like my favorite person in the world okay. I definitely recommend her Shades of Magic books. Maggie is another one of my faves, but I definitely think her books have that weird appeal to them where some love them and some hate them. The shiver trilogy is my personal favorite. Lovely post Ellie! And don't feel bad for not having read any of their works. We all have our different tastes. Ahhh I know exactly what you mean! There are plenty of authors whose work is like that for me. Thanks for the help! I just looked up the Shiver trilogy and THAT IS HOW YOU DO A COVER MAN. JOIN THE CLUB MAN. Ahhhhh, I'm the same way. Some of those books have been hyped so much it feels like disappointment is probably inevitable. Personally I love Rick Riordan and all of his books. If you do want to start reading some stuff that he has written and just pick and series and find the first book. Awesome post! OKEY DOKE I WILL HELP U OUT WITH RICK RIORDIAN. please honey of you can figure out the discworld books then you can figure out this. WHERE TO START- Percy Jackson and the Olympians. This follows percy the greek demigod and his adventures. There are 5 books i read them in under a week. THEN we start getting the POVs of other characters when we start adding roman gods into the mix. This series is called the Heroes Of Olympus. So yes, there are lots of characters when you get into the second series, but overlapping timelines are not a thing between books. Idk what MG stands for. Just read in the order you see the titles. BUT WHAT ABOUT ALL THIS SEA OF MONSTERS AND KANE CHRONICLES AND TRIALS OF APOLLO BUSINESS. Where does that fit in??? Discworld is easy though. You just read them in the order they were published and skip book 13 because it's one of the worst books I've ever read ever and it had absolutely zero relation to anything else in the series. Wait I thought Sea of Monsters was its own series is this not the case. AND MAGNUS CHASE. WHO IS HE AND WHAT DOES HE HAVE TO DO WITH ANYTHING. COMPLETELY DOFFERENT SERIES. NOTHING TO DO WITH PERCY & co.
the kane chronicles is egyptian gods. Still good, nothing to do with percy's universe. Magnus chace is norse gods. The only connection is he's annabeth's cousin. The universes do not merge other than that. Ohhhh okay, I get it. Thank you! Trials of Apollo circulates around the Apollo god from the PJO series. That means it is in the same god universe as PJO. Its about how Apollo did something bad that he was punished into being a mortal. As for the Egyptian, there are some crossovers about with the PJO from Riordan himself, Staff or Sorbek or something. I did not look it up for more, yet. I what you mean about Clare and Riordan, though. Gwen's right, for the Riordan, you should start with PJO. I think Clare's world is more complicated than Riordan's, haha. These kind of authors are confusing in terms of the world they created, but also are brilliant as they can weave several books or realms together. Haha I haven't read any of those but Cassandra Clare oops... Let's live under a rock together! I personally recommend starting with the Infernal Devices (Clockwork Angel, Clockwork Prince, Clockwork Princess) and then reading the Mortal Instruments (City of Bones, etc.). BECAUSE THE INFERNAL DEVICES IS THE BEST. It's set in Victorian times, the main characters are AWESOME, the plot is really fascinating, and JUST THE SETTING IS THE BEST. PLUS TALE OF TWO CITIES REFERENCES OH MY GOSH. (I'm showing my English nerd aren't I? Unpopular opinion here but Tale of Two Cities is best thing written in the 1800s and Infernal Devices made me love it even more.) My opinion here but I think compared to that the Mortal Instruments are really...bland? I don't know the Victorian setting appeals to me WAY more than modern day haha. But anyway. The point: read the Infernal Devices. If you love the world, read everything else in the order in which it was released. If you don't, just know you read the best part (at least for me haha). I WANT TO KNOW WHEN YOU READ YOUR FIRST MAGGIE STIEFVATER BOOK SO WE CAN FANGIRL TOGETHER. Because she is freaking. awesome. Read The Scorpio Races first...it's easily my favorite out of all her stuff just because it's so...just...amazing. All, the audiobook is perfection. And Victoria Schwab is very Maggie Stiefvater-like. They have super similar writing styles and just...well...READ THEIR STUFF. And then come talk to me. OKAY I PROMISE I SHALL TELL YOU. Ahhh, I'll try that! Until this post I literally thought The Raven Cycle was her debut series, oops. Ahhh same! I've tried reading GoT but DNF'd it, so I might try out the show. I've read all of them except Cassandra Clare. I don't think I'll ever read any of her books... it just doesn't interest me too much. :P So you're not alone! HOW did you NOT KNOW what POKEMON was?!!!! HOW????? Also READ THE RAVEN CYCLE. I promise you will NOT regret it. And you know how much I love V.E. Schwab. Start with Vicious! As for Rick Riordan, start with The Lightning Thief. And for Cassandra Clare, I suggest reading her Shadowhunters books in publication order. So start with City of Bones (although it IS my least favorite, the rest are awesome). Good luck! I DON'T KNOW I LIVED A SHELTERED CHILDHOOD OKAY. I used to love Rick Riordan's books! But then I fell behind with his books and got lost. I do want to start reading them again, though. I used to read Rick Riordan when I was a kid. I've heard of Cassandra Clare but no-one else on that list. Honestly, if it weren't for the book blogging community I doubt I would have either!